On June 23rd this year, we in the UK are going to take part in the most important referendum for a generation. 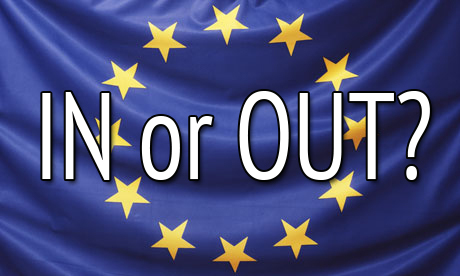 The upcoming EU referendum rightly sparked huge debate and seems to have our nation divided right down the middle. What is perhaps most shocking is that the debate headlines revolve around fear mongering from both sides. Apparently, no matter which way we vote, we will be in recession, lose our homes, spark a civil war and probably finish off the polar ice caps while we're at it! How should Christians use their vote in the EU referendum? Firstly, let me be clear that CEC (Chessington Evangelical Church) does not take an official position either way. As Christians, we must vote according to our conscience while seeking to maintain our "unity in the Spirit in the bond of peace". We may have individual strong opinions but that is what they are, opinions. We must love and respect those whose views differ from ours. Remembering that what we share in the Gospel, is far greater than our different views on this issue. Church unity is far more important than this issue. After all, all human institutions (EU, UK, UN) are temporary, but the church will remain for eternity! That all being said here are a few pointers to help guide you along the way to your decision. I'll keep this obvious point quick and simple. Whatever you do, pray about your vote. Pray to the God who promises to give wisdom about anything (that includes referendums) to all, without finding fault. 2. Not being swayed by fear. It's not easy to do with a debate as heated as the EU referendum, but trusting God is important. Read the next sentence and let it sink in for a few moments before you read on. God is Sovereign over this referendum. Yes, we have to pray, research and use our vote well. However, in the end, our God is in the Heaven's and He does whatever he pleases. We must trust that whichever way the final tally swings, God is King and nothing happens outside of His will. That simple truth is a burden lifting, peace bringing truth for every believer. Even if the doomsayers on both sides are right, King Jesus is in control. And King Jesus works all things together (including referendums) for the good of those who love Him. In order to use our votes as Christians rightly, we must understand the issues and what is at stake on both sides of the debate. In order to do this, we must research carefully. Here are a few useful places to get information from both sides. Please feel free to add more in the comments below. Here are two speeches that were given by people on either side of the debate (selected because they are more measured and less heated than a lot of speeches on the subject). 4. Remembering, salvation cannot be found either inside or outside of the EU. At the end of the day IN or OUT, Europe still needs the Gospel. According to the latest statistics, there are more atheist, agnostics than ever before in England and Wales. So whatever our view of BREXIT, we must remember, whoever wins the majority of people in our country are lost and in desperate need of the Saviour. I wonder how often we have asked ourselves as we've wondered which way to vote, which outcome is best for reaching Europe with the Gospel? Is it to maintain open borders with the EU, so we can freely send missionaries and plant churches all over the Europe? Or is coming out of Brussel's tightly secular grip, going to free us to evangelise more openly? I don't know the answer to those questions (or even if they are the right ones to ask), but I am praying God would give me the wisdom to vote wisely in light of the great need of the Gospel. At the end of the day, if our mortgages go up, our currency collapses, the polar ice caps melt or whatever the consequence might be in the latest headline, in the light of eternity it doesn't matter all that much. In fact, all those disasters pale into insignificance compared to the outcome of this referendum, somehow closing our opportunities to reach the lost with the life-saving message of Jesus Christ. In conclusion, pray, trust, think, vote and keep preaching the Gospel! As the Pastor of Outreach at Chessington Evangelical Church my role is to equip, inspire and build up the church in Evangelism. The goal being to bring glory to God by seeing people come to know Him as their Heavenly Father. Before my current role I have been working with London City Mission for 12 years. Where I have been involved in community evangelism through LCM centres, church planting, arts ministry and church attached work. I am married to Emelie (from Sweden) and the father of two amazing boys, Gabriel (3 years) an Noah (10 months).